Domino’s software engineers and digital ad team have created a unique AI-powered ‘Piedentifier’ to launch it’s Super Bowl week marketing blitz. Domino’s is encouraging people to send in a photo of any pizza, even if you made it yourself, and it’s system will determine what type of pizza it is and give you ten points toward a free pizza in their rewards program. We’re going to give Piece of the Pie Rewards points for any pizza. Our customers are going to be able to use our great technology to take a picture of any pizza, send it up to us, and earn ten points toward a free Domino’s Pizza. The great thing about this is our team got together and created something called the ‘Piedentifier.’ What it does is it uses your phone to look for what they have referred to as the open-faced expression of crust sauce and cheese. Anything that looks like a pizza and you’re getting ten points. Today we’ve got more than 20 million active members of our Piece of the Pie Rewards program. We don’t know the exact number of how many customers will come on board with us, but as the leader in the pizza category, we see this as a great opportunity not only to grow the overall pizza category, but also to invite new customers in to download our app and to try our product. We feel that when customers try our product we’ve got the opportunity to bring them back again and again. This Sunday is a huge day for us. On Super Bowl Sunday, we’re typically up about 40 percent over a normal Sunday. We’ll sell about 2 million pizzas and about four million chicken wings. Each year, it’s the biggest day of the year for us. It tends to not matter which teams are in the game. Certainly in individual cities maybe it does, but broadly across the US it’s a huge day no matter who’s playing. 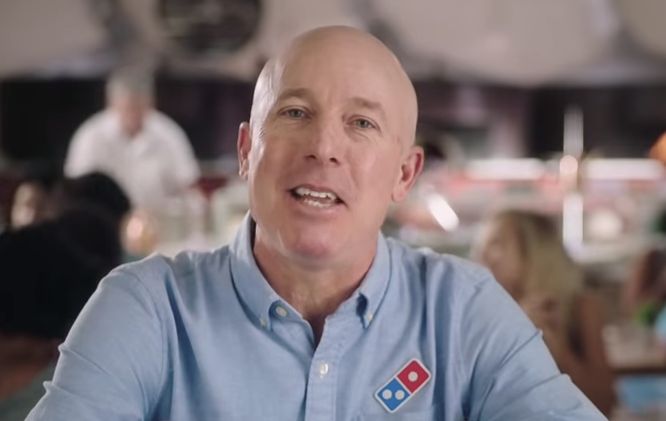 Opening up a Domino’s Pizza store is still a terrific return for our franchisees. Across the globe cash on cash returns are better than three years in our business. Just a few weeks ago at our Investor Day, we released again our unit level average for our franchisees in the US. Once again it went up. We’re expecting it to be somewhere between $137,000 and $140,000 a unit in the US on EBITDA on a Domino’s Pizza store that you can open for $350,000. Driving for Domino’s is a great opportunity because of the volume that we do out of our stores. In a lot of cases, drivers are able to come in and earn a lot more than they can driving for some of these other businesses. As we continue to tighten down our territories through our fortressing program, it’s giving our drivers the opportunity to get more runs per hour. That means more tips per hour and in turn, higher wages. In addition to a job that earns a decent wage driving at Domino’s is also an opportunity potentially to be a franchisee in the long term. Over 90 percent of our franchisees today started as drivers or started in as CSRs answering our phones in our stores. Self-driving cars will be here someday. We don’t exactly know what day but we’re working hard to really try to understand how our customer interface with that car when it pulls up to their curb. They’re used to having a uniformed Domino’s pizza delivery expert bring that pizza to the door. So we’re learning. As the technology evolves we’re going to learn how the customer wants to interact with us and we’ll be ready when it does get here.